Posted on March 9, 2007 by Chad O. LAPTOP Magazine has completed their review of the Asus W5fe. 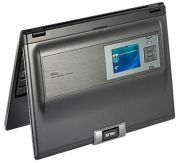 The Asus W5fe is a Intel Core 2 Duo-based ultraportable laptop with a 12.1-inch widescreen display, and is the first laptop to feature Microsoft Windows Vista “SideShow” feature. The SideShow feature is basically a secondary display on the back of the laptop that can be used to access information (e-mail, phone numbers, contact information, etc.) while the machine is powered off and the display closed. You can see it in the image to the right. If you want the SideShow feature, this is the only game in town for now. The SideShow display measures 2.8-inches with a resolution of 320×240. We’re pleased with the idea of SideShow and that Asus has managed to be the first on the market with a reasonable platform for it, but at this stage the W5fe doesn’t live up to its potential. This notebook is certainly innovative, but it’s not the best ultraportable you can buy for the money.